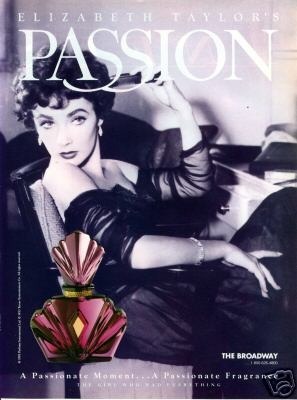 “Passion, I see, is catching” W. Shakespeare as quoted by Elizabeth Taylor on her launch for Elizabeth Taylor’s “Passion”. All my adult life I have worn perfume and in my milieu not everyone digs it. But I do so, off to a sulfurous hell with them! My earliest encounter with perfume was as a child at Christmas when my Uncle would give a bottle of Chanel No.5 to every woman in our family. We were not rich by any means so this was a real treat for my Mother, my Aunt and my Grandmother. I fell in love with the glamour of it all on the spot. At 21 I bought my first bottle of Chanel Pour Homme and discovered that the universe of men’s fragrances travels eons beyond the gas giants of English Leather and Old Spice. I caught the perfume passion and have never looked back. Yet for years my fragrance shelf was a sad affair, just that one bottle of Chanel Pour Homme which over the years morphed into Chanel Pour Monsieur and then into Chanel Pour Monsieur Concentree. (all of this change because of reformulations.) Nothing new came into my olfactory life, only the bottle changed every couple of years. Then a good friend of mine, Steve died. He was only 38 years old at his passing. I had the job of helping clean out his apartment. He had an interesting medicine cabinet. It was full of exotic bottles of Fahrenheit and Calvin Klein Obsession, Van Cleef & Arpels. They ended up coming home with me. That was back in the late 90′s. I used them and as they grew older I often thought I should get rid of these and buy something new. A few of them had turned. But I never did anything about it. Then about two and a half years ago I met a man, an actor and director in New York. We fell in love and he asked me to be his life partner. 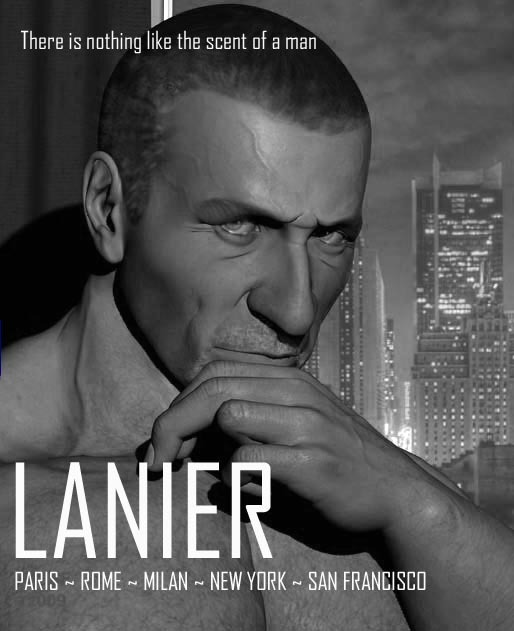 This unexpected man, Bryant Lanier came at the beginning of my third act. I had given up on ever having a life partner and was quite content to move into old age on my own. I was used to that and knew how to do it. Besides I enjoy being with me. On December 28th 2011 he went to see an ear nose and throat doctor about a mild complaint. That night he was admitted to the hospital and the next day he was diagnosed with Leukemia. Three weeks later on January 19th he died. I was in shock. He was planning to move from New York to San Francisco and begin a new life here. He wanted to build a small theater and create great shows for undiscovered talent. But he wasn’t going to do that now, he was going on a differnt trip. His friends packed up his apartment; his body was cremated and his ashes sprinkled in the sea in Key West. (He once told me he never wanted to go back there because it held bad memories for him.) Life never really turns out the way you expect it to. A month later still numb unshaven and unwashed I opened my medicine cabinet. My bottle of Chanel Pour Monsieur was empty. Steve’s old bottles were looking sad. So I went shopping and bought a new bottle of Chanel, then a bottle of Versace Eau Fraiche, then a bottle of Givenchy this and Bulgari that. I found the fragrance website Fragantica and began to learn about notes and olfactory groups and sub groups. I met really nice knowledgeable people there in the forums; I got out of bed on Saturdays again. I began to review my new scents creating a screen name from my boyfriends last name, I began to shave and look in the mirror, I went shopping, I rediscovered life and laughter and the joy I always had for life. The world moves on and I rejoined it all because of something as ephemeral as a fleeting scent on my wrist. This blog is all about my discoveries over the years since Bryant’s passing of the ever expanding and exciting world of fragrances for both men and women. I will start off with some of my reviews from Fragantica and some stories of my adventures looking for something that smells good. I hope you will come with me. 2017 UPDATE: I am now living in Olympia Washington… Farewell beautiful California, and hello gorgeous Washington State! Thank you so.so much for your enchanting stories. I love them and enjoy both the stories and your comments on perfumes. Your story and you way to tell it is perfect the most interesting one. I am amazed at your talent even more so because it came to you quite recently. You must be a born “nose” with a late revelation. Impressive. Oh Frederique you made my morning sparkle with your kind comment. Thank you so very much. What a beautiful life story so far… sad about your soulmate, but I do believe “ It is far better to have loved than to have never loved at all” I also believe you are an articulate and wonderful gentleman. I appreciate you sharing this. Thank you and be well my friend. Thank you Mike! I hope you take the time to read my post E.T. and Me… and Glamour Bowl. I think you will enjoy them. Cheers.